Well, hello, again, Re-Inkers! 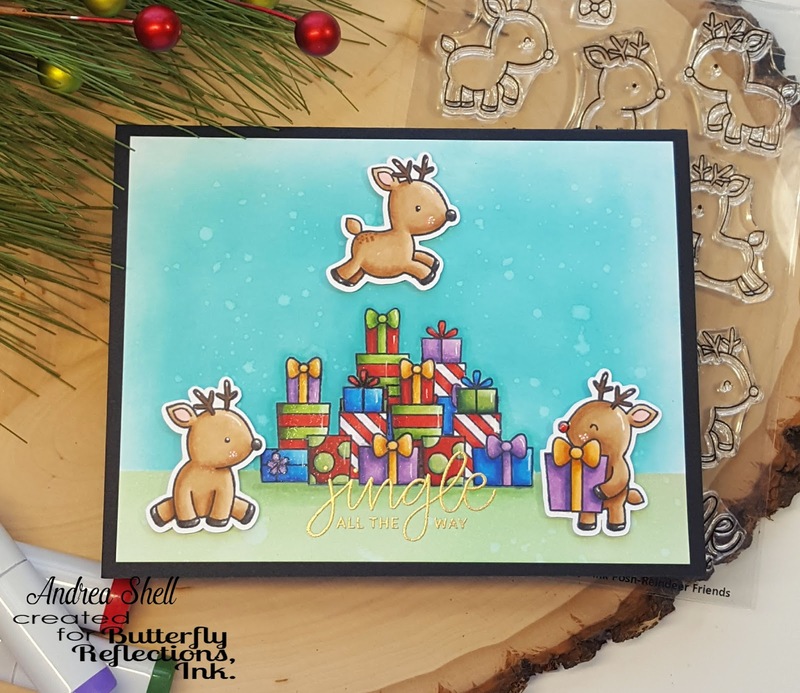 It's Andrea back to share a fun Christmas card featuring the oh-so-adorable reindeer from Pretty Pink Posh's Reindeer Friends set. Sometimes I like to imagine story lines for my cards. For this card, poor Rudolph has been hard at work wrapping and stacking presents for Christmas Eve while the other reindeer enjoy a game of leap frog over his hard work. Not cool, I say, but so darn cute! All of the images were stamped with Memento Tuxedo Black Ink and colored with Copics. To create the stack of presents, I first created masks from Stamping Masking Paper. Once I had all of my presents stamped, I masked them to work on my background, which I created with Cracked Pistachio and Peacock Feathers Distress Oxide inks. After everything was colored, I added details with a white gel pen and lots of sparkle with clear Wink of Stella (I know, big surprise, right?). I also added just a dab of Glossy Accents to Rudolph's nose. I heat-embossed in gold a sentiment from Reindeer Friends and adhered the background to a black card. Those adorable deer were popped up with foam tape. Thanks for stopping by! For all of my American friends, I wish you a very Happy Thanksgiving! Andrea, this is SO cute!